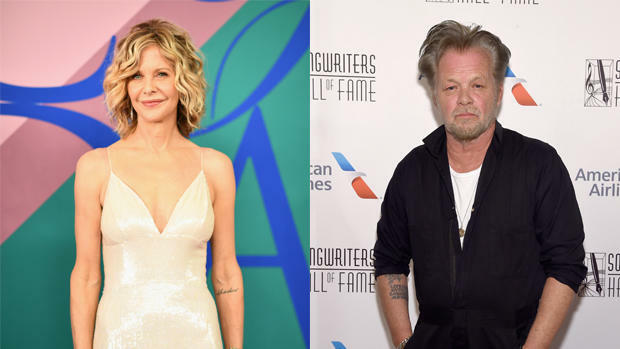 Meg Ryan and John Mellencamp are engaged. The actress and musician rekindled their on-again, off-again relationship in 2017, reports ET. Ryan was spotted on Halloween sporting a diamond ring on her finger. On Thursday, Ryan confirmed the engagement on Instagram. She posted a doodle of herself with Mellencamp and captioned the post "ENGAGED!" It's a great twist of fate for the "When Harry Met Sally" actress and the "Hurts So Good" singer. Just last March, Mellencamp claimed that his now-fiancée couldn't stand him. He and Ryan started dating in 2010 and broke up five years later. Last March, Mellencamp said on Howard Stern's SiriusXM radio show that it was unlikely he and Ryan would reconcile. The two have had an on-again, off-again relationship for years. He continued, "I think it's because I'm a child. I throw fits, I gripe, I complain. I'm moody. Every bad thing that a fella can be, that's me." In July, a source told ET that the two were dating again. Mellencamp has been married three times, and was dating Christie Brinkley in 2015 and 2016. Ryan was married to Dennis Quaid for nine years.